In 1972 it was not often to see other types of cichlides in my town. 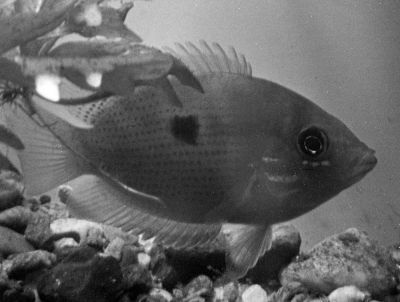 But in 1972 I was seen the beautiful Etroplus maculatus, Yellow Indies Cichlid for the first time. I was buying some of them and reading that this was a brackish water cichlide. I gave them a 60 liter aquarium when I come home. After some time I was seeing that two, one some bigger than the other (female) beginning to be very interested in each other. I was taken out the others from the aquarium and after some time they were breeding and gave some youngster. This species I also have in 1982 and had some breeding of them. This a beautiful and peaceful species how need a aquarium by them self. In a aquarium to a friend in 1983, how had buyed youngster from me. It was about 10 of them in a 350 liter aquarium. It was interesting to see 3 couple of them breeding in several places in the aquarium with many youngster. Today, there have been 35157 visitors (90857 hits) on this page!